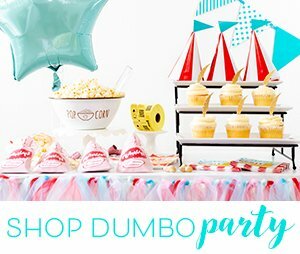 Summer is flying my friends and we’re already focusing on getting ready for back to school. My son starts a lot earlier here than we’re used and we’re still trying to adjust. Trying to cram it in while squeezing the last bit of fun out of summer! 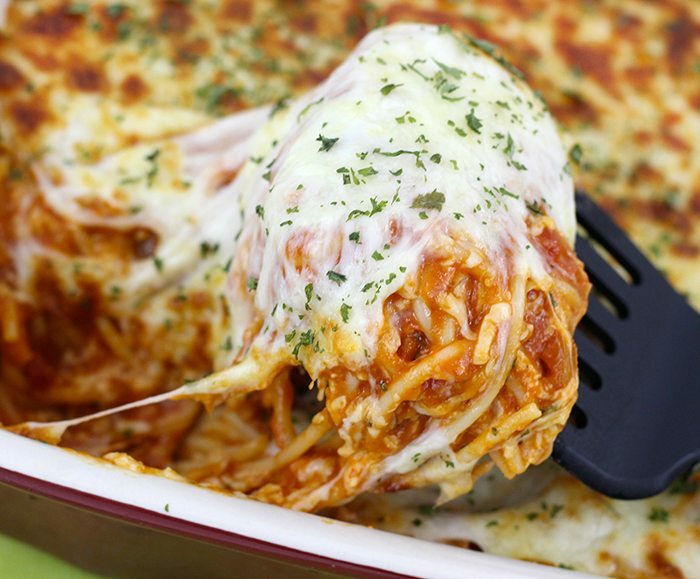 This easy cheesy baked spaghetti recipe is perfect to get into gear. This is a sponsored post about Ragu, all opinions are my own. Having go to dinners for busy school nights is always a big help… especially meals tasty enough to really bring the whole family together. 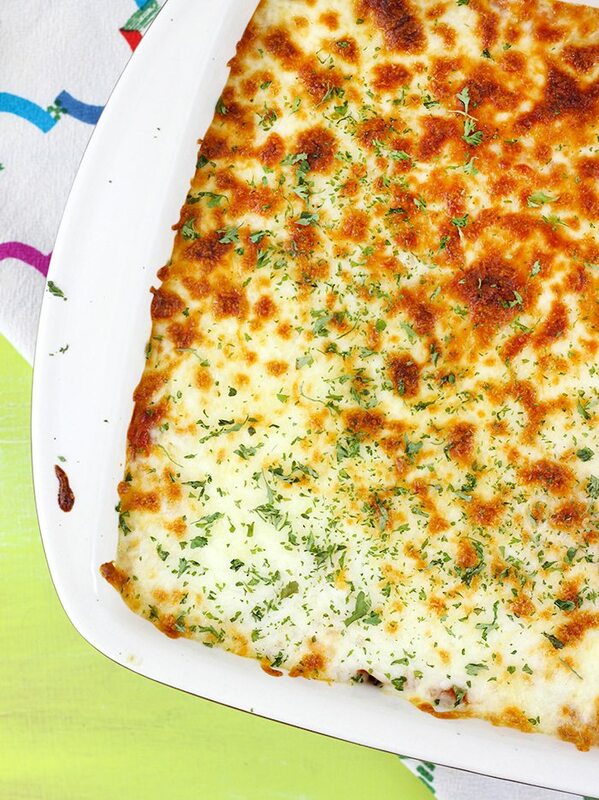 This baked spaghetti is creamy, cheesy and beyond easy to whip up when your crunched for time. 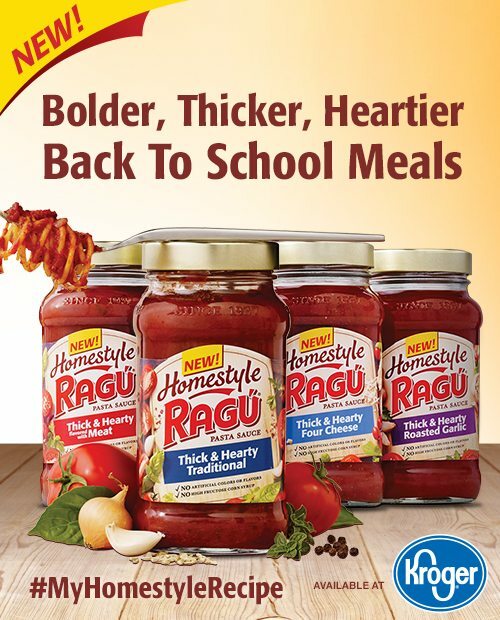 Delicious flavor is made simple with Ragu Homestyle Pasta Sauce available at Kroger. I decided to use RAGÚ Homestyle 4 Cheese variety to really amp up that cheesy flavor. Because… mmmm. Cheese! 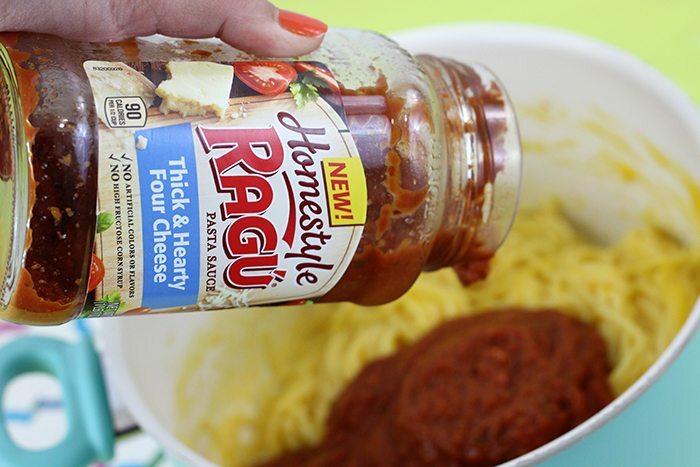 With NO artificial colors, NO artificial flavors and NO high-fructose corn syrup, Ragu Homestyle an easy choice. 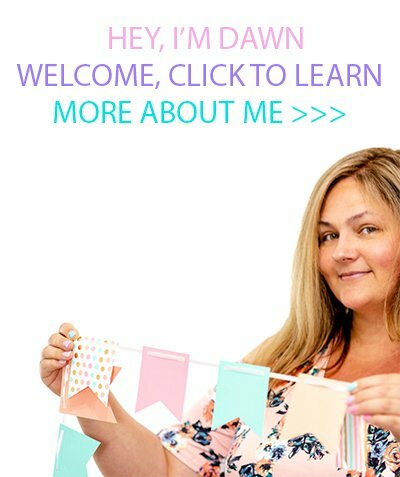 I love keeping stocked up on their sauces because I can whip up so many tasty meals on the fly! That’s what I call a win, especially for B2S! Sometimes when you bake with sauce, it can get dry. I usually add more sauce, especially for next day serving. This time I decided to try something a bit interesting. I added condensed cheddar soup to the mix and oh boy does this make it super creamy! Total win! To also save a little time and get dinner on the table quick, I chose to broil the spaghetti & cheese for a quick 10 minutes. You can get this dinner on the table in less than 30 minutes! When it comes to having a busy family, every single minute counts. Ready to dig in? Save this recipe & add it to your B2S rotation! Cool spaghetti and drain. Add the spaghetti back to the pan you used. Add condensed cheddar soup and sauce, mix until blended. Stir in 2 cups of the cheese. Transfer to a small and shallow baking dish (about 9" x 8,5"). Spread the remaining 2 cups of cheese evenly over the top of the spaghetti mixture. Broil on low for about 10 minutes or until cheese is golden and browned. Want to try these yummy sauces for yourself? Enter to win a $25 Kroger Gift Card over here on my Facebook Page. Which of these delish sauces will you be picking up at Kroger? i dont make spaghetti, but i have used Ragu making vegetable lasagna and pouring it over chicken and vegetables. i am not a spaghettie eater and never have been even as a child. This looks so delicious! My family likes spaghetti and it is easy to make as well as inexpensive. 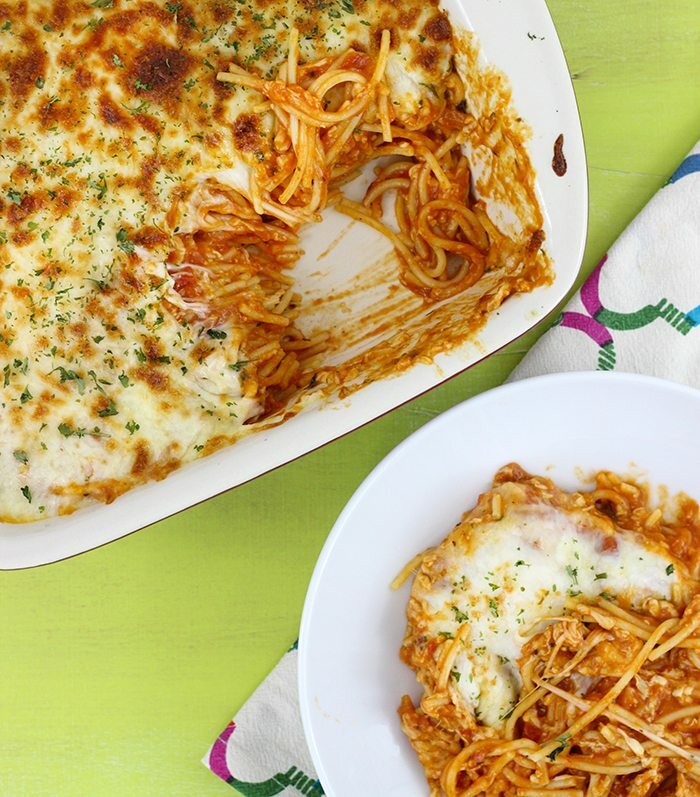 Turning our Tuesday spaghetti into this cheesey delicious treat will be a winner at our house. I've had baked spaghetti, but never tried to make it myself. No idea why not, it does look very easy to do! I could eat some of that! I love cheese, hubby says I am not capable of cooking without it. This looks super cheesy, and similar to a dish we make with a different pasta that everyone loves.